These pendant lamps are just as beautiful in person as they are online. They come well packaged. The glass and the metal components look high quality. I love that there is a metal pole instead of just a cord or chain - keeps the look clean and adds another touch of brass/gold. I held the lamp up to a solid brushed brass drawer pull and it matches almost perfectly (one from "Schoolhouse"). The tone of the brass gold is well represented in the photos online. The width is great for my smallish kitchen island, because I can fit two above the island. 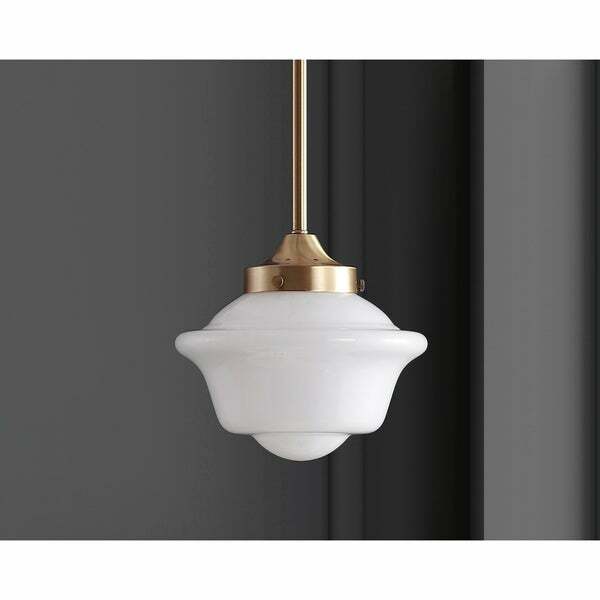 I've noticed higher end stores are carrying a lot of the white glass shades lately, so I was happy to find something here that looks just as high quality for such a good price. They have enough shape to add interest without being gaudy. Also, as much as I love clear glass lamps, I will enjoy not having that overkill light that comes with having essentially a bare lightbulb hanging over-head. The white glass should deliver a more tolerable light. Dimensions 7.25 In. X 7.25 In. X 15.0 In. Safavieh Lighting Sabine Pendant -Copper - 10" x 10" x 12.184.1"